I am a person who has two lives. In the Philippines, I am an e-commerce advocate while in Australia, my role is more focused on taking care of the family as my partner has a work contract here up to 2010. I'll be back this weekend (after being gone for nearly a month) bringing all the wish list items asked for by the kids. To help me lose weight, my partner bought an exercise equipment through eBay so I hope that will work. It seems I have a trend of publishing a book every 4 years. I'm supposed to print a blogging book but its content can't seem to stand out as there's nothing groundbreaking that I can offer in terms of insight that has not been said by a prestigious blogger online. However, the E-Champion award (photos) that I got last Tuesday is providing a much needed inspiration, to work on another idea that focuses on lessons learned in cyber legislation. Although I still need to do some market test to see if it indeed has a demand. My niece passed away more than a week ago. Her operation did not go well as intended and she went through five (or six) heart arrest and eventually gave in. I'm thankful being in the country during that stage. Somehow, the weird flight unavailability made sense. I'm supposed to return last January 31 but the only one available was February 16 that forced me to revise my schedule. I got the chance to see Aleah twice prior to her operation. Despite her condition, she was very playful, affectionate, and engages in "repeat-what-i-say" games. The funny one I recall was when we say "pa-a" (which means foot or feet) but she will say it as "a-pa" (which means cone, as in ice cream cone). She also likes to be infront of the computer pretending to be typing something. My sister, now back to work as part of her coping mechanism, her husband, and the rest of the family are still in grief with our niece leaving too soon. To the point that just thinking about it already makes me teary-eyed. If plans will push through, my sister's husband will be in Australia within the year to work and my sister shall follow afterwards. Life goes on. 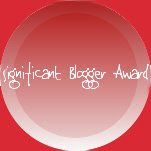 What got me into writing this post was when I saw my blog as recipient of this touching award. I've been blogging about my life and observations in Australia for less than a year now. To somehow get noticed, part of what I did was track how Aussie blogs are doing using available measurement tools out there. I'm glad that these efforts are being appreciated. The Aussie blogging community, whom I noticed to be very patriotic to their country and fellow citizen bloggers, are also welcoming of other citizens and culture who are trying to establish some ground to grow on. Congratulations Janette on your multilple awards :) That's absolutely awesome!! @angesbiz - thank you and will make time to read the book you sent so I can write a review about it. Cheers! Thank you everyone for your prayers. It means a lot to me. And congrats with your awards. Also, I know I'm very late - but I thought I'd send in my belated birthday greetings too. @jhermie - see you soon in Oz! @imwithsully - thank you and congratulations too! @shai coggins - thank you and see you at the meet-up!